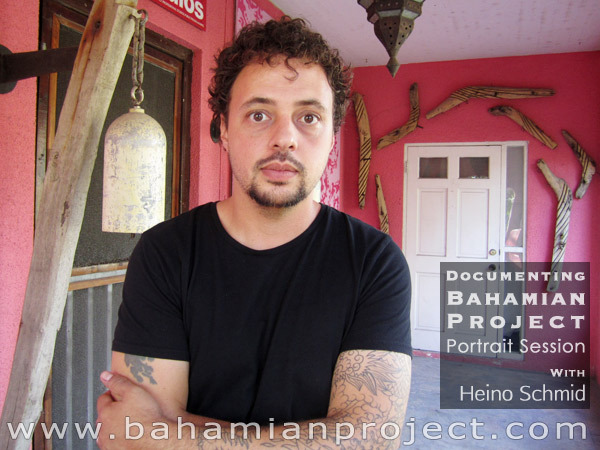 This picture of Heino Schmid was taken right after his portrait session for the Bahamian Project. The final portrait images will be unveiled at the Exhibition Opening at the National Art Gallery of The Bahamas on July 11, 2013. It is as simple as it sounds and yet as profound as one might conceive. It is Heino’s motto, the backbone of how he operates and the undertone of everything he creates. He honours his instincts, trusting where they take him, whether or not even he knows where it is going. Born in 1976 in Nassau, Heino completed his MA in Fine Art at the Utrecht School of the Arts, Utrecht, The Netherlands and BFA degree in Photography at the Savannah College of Art and Design, Savannah, Georgia, USA. He studied at the College of the Bahamas, where he is now an adjunct lecturer. He is the curator of the Central Bank of the Bahamas Art Gallery; and exhibitions director of Popopstudios International Center for the Visual Arts, a non-profit artists’ co-op where he also holds a studio. Heino was the recipient of the Commonwealth Connections Residency for 2010 and participated in the International section of the 2010 Liverpool Biennial. He has taken part in many group and solo exhibitions in The Bahamas, United States, Netherlands and United Kingdom and has received numerous awards. Recently, he was invited to participate in VOLTA NY, a critically acclaimed satellite art fair to The Armory Show. As an artist I admire Heino Schmid. I think he is a true artist – his work is raw and real and always feels nakedly genuine – it feels honest. 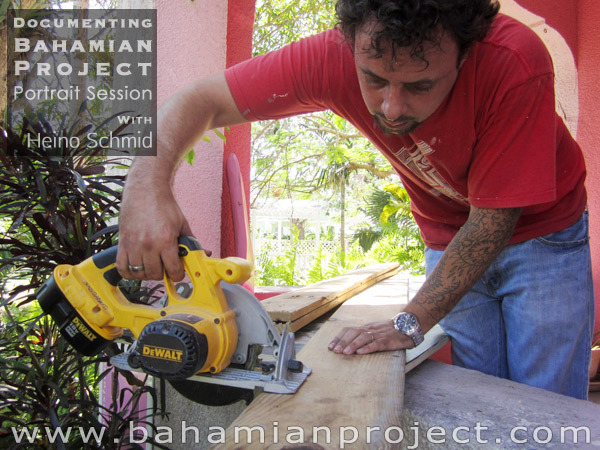 Heino Schmid working on his Bahamian Project portrait set. No other Bahamian Project portrait subject had to work as hard as Heino did to prepare for his photo session. He sawed, drilled and nailed. “The context of much of my work is concerned with narrative and the reconsideration of personal stories in the public forum. Using a variety of media such as video, drawing, installation and photography, I investigate the often simple, sometimes irrelevant encounters and collisions between people and their environments.